Sometimes traveling on business can seem kind of lonely. What if there was a way to easily find out if someone you know lives in the area you are traveling to? That is the idea behind JetZet, a new itinerary management website that allows you to organize plans in one place, manage relationships while you’re traveling and receive automatic updates. Travelers can import details stored in Outlook, Google, and iCal along with their contact lists from social networks and email. JetZet competes with other web and mobile itinerary management services such as TripIt or check-in services like Foursquare. What sets JetZet apart is that it is focused on allowing you to reconnect with old friends and business connections at airports or travel destinations. Users can create “circles” for different groups in their lives, such as co-workers, family or friends and decided who to share each trip with, much like Google+. These groups of people can be from social networks LinkedIn, Facebook, Twitter, or your email contacts. CEO Nick Farina has plans to add value to JetZet in the future with ExpertFlyer Seat Alerts. Soon you’ll be able to check for availability of airline seats, possibly so that you can sit with people you already know also traveling! The beauty of JetZet is its simplicity. You can easily import all your information as described above, and then see which of your Facebook, Twitter of LinkedIn pals are located in your destination. For example, I am traveling to Las Vegas this weekend. As prompted, I added my trip dates and hotel. Under “Local Friends” I can find people I know that live in Las Vegas…unfortunately, I don’t seem to know anyone yet! However, for my Bay Area trip following, there are 24 of my Facebook friends that live in San Jose. 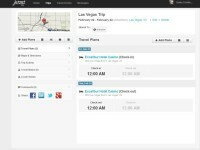 JetZet is a useful tool for maintaining relationships for frequent travelers. Would you use JetZet on your next business trip? Feel free to share your comments below!